Q. Why does the kohen comes first in the call-ups to the Torah? A. Originally there must have been a scramble for first place. Then an enactment (takkanah) made in Talmudic times determined that for the sake of communal harmony the first place should be given to a kohen and the second to a levi (Gittin 59a). The pre-eminence of the kohen is because of the Biblical command to honour him – v’kiddashto (Lev. 21:8). In some communities there was a custom on Shabbat B’reshit to give the first call-up to a generous person who sponsored ner lama’or, the oil lighting for the synagogue, for the whole year. This usage began with the agreement of the whole community including the kohanim, which shows that the kohen’s place is determined by established custom, and the custom can be varied if really necessary. 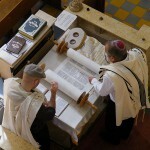 It is customary in some congregations for the rabbi to be given the first call-up as a mark of honour to the Torah. This entry is filed under Ask The Rabbi, Kohanim, Prayer. WordPress generated this page with 31 queries, in 0.235 seconds.